At Hidden Valley Inn, hikes range in difficulty, length and interest. Our staff is here assist guests in custom tailoring daily expeditions to personal ability and comfort level. We also provide complimentary use of 21-speed mountain bikes are available to guests. The Hidden Valley Institute maintains over 90 miles of trails, all well marked with signage and cleared and checked regularly. The trails have been designed to take hikers and bikers through areas of the Reserve that are chosen for their outstanding interest and beauty. Repairs and maintenance are done using the surrounding natural resources; stairs, bridges and ladders are crafted from felled trees. For convenience and safety, hikers and bikers are given two-way radios in the event a return ride or directions are needed. Comprehensive guided tours are always available. Always bring water and insect repellent. While self-guided exploration is an excellent way to experience the property, we do recommend taking at least one guided tour. Our guides bring their full knowledge of the Reserve and its flora and fauna to your expedition. Their acute awareness of the surrounding nature truly enhances your experience as well as your likelihood of spotting rare birds and wildlife. Hiking and biking routes include short treks and all-day excursions. Along the way, resting places have been created and sometimes include hammocks, chairs and table and jungle platforms. Hidden Valley Inn can provide pack lunches and, for a little on-trail luxury, guests can request that lunch and drinks be set up at a pre-designated point along their route -- anything from a casual picnic lunch to a luxury spread. It’s called Cascade Trail because as you hike you will pass dozens of little streams and cascades, and walk over many bridges. The highest bridge on this trail is called the Sky Bridge. The trail is beautiful and one of our jewels. Start the trail from the “Beverly’s Lookout” end so you walk facing the cascades. Meander through tropical broadleaf jungle from Butterfly Falls to Devils Falls (40 minutes), a series of waterfalls and pools tumbling off the escarpment. The last pool, accessible by a wooden ladder, is ideal for a refreshing dip. Approximately a 2 to 3 hour walk from the Inn or a 20 minute hike from the parking area near the Falls. This jewel of the property is an 80 foot waterfall cascading into a crystal clear pool just made for swimming. It feels as though you’re in a lost paradise as you look up at the rock walls hanging with bromeliads, orchids and ferns. This idyllic hideaway can be reserved for your exclusive use. This includes a champagne lunch and pick up and drop off by vehicle. Hike from the source down to a crystal clear pool (40 minutes) at the base of a waterfall where you can swim or relax in a hammock. Located along the edge of one or the Reserve's most picturesque waterfalls and pool, The Palapa jungle platform has a slate floor with two chairs and hammocks...a very romantic spot. The platform is often used by honeymooners for private picnics. Swim, lounge and sip champagne adjacent to one of Mother Nature's jewels. This dammed creek has a thatched palapa complete with hammocks and a cozy table and chairs. This venue is also available to rent exclusively including a champagne picnic lunch and pick up and drop off by vehicle. The falls are a 10 minute stroll from the car park. Due to the terrain around Hidden Valley Inn, all of our mountain bike trails are strenuous and require a medium to high level of fitness. A more specialized mountain bike will be provided ONLY for guided tours. During the ride, the guide will point out interesting flora and fauna and provide an overview and history of the Mountain Pine Ridge area. Maximum of four riders per tour. Leave from Hidden Valley Inn, biking down towards Lake Lolly Folly. Head up towards Tiger Creek Falls Lookout to enjoy the breathtaking views. Ride around the edge of the lake towards the neighbouring farm, skirt around the edge of the farm biking towards Coffee Grove Trail and stop for a brief talk on Hidden Valley Inn’s coffee production. Your mountain bike venture then takes you down a single track, jungle trail which ends on Service Road; from where it’s a short 1.5km ride back to the Inn. 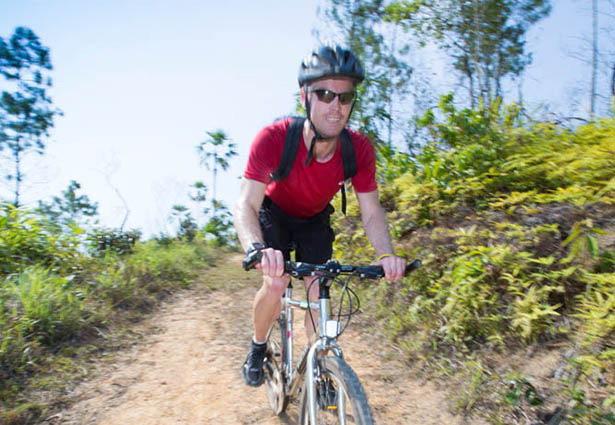 This tour involves both mountain biking and hiking, taking in some of the reserve’s most beautiful areas, and involves a HIGH level of fitness. This tour also includes lunch. Leaving from Hidden Valley Inn mountain bike towards the Coffee Grove Trail. This single track, jungle trail takes you to Service Road then linking up to Coati Drive. From Coati Drive, make your way to Crossover Road and onto Dumbcane Road, which is the route towards your first scenic stop – a mini hike and swim spot – Secret Pools. Thereafter follows a short mountain bike to the parking area of Butterfly Falls, followed by a 25-minute hike towards the Falls. From Butterfly Falls the adventure will continue through the jungle towards Devil’s Pools – another gorgeous swim spot. The hike from Devils Pools will take you out along Puma Trail where you will find your bikes. Your lunch stop then awaits you at Bulls Point, a short distance away from Puma Trail. Here, enjoy stunning scenery while indulging in a picnic-style lunch. The bike route then meanders slowly back towards the Inn going past Lake Lolly Folly en route and finally up Farmhouse Road to the Inn. Both of these are suggested routes and can be customized to guest preferences, our mountain biking guides are always available to discuss routes on site.